We all know cake is delicious, and lollipops are delicious. So why not combine the two into one ultra-delicious package? Funfetti lollipops are cake-flavored lollys festooned with colorful sprinkles. They're sure to brighten your day! They're perfect for birthday parties, as edible favors, or just an anytime treat. See the Notes below the recipe for more flavoring suggestions! Prepare your hard candy lollipop molds by coating the cavities with a very light layer of nonstick cooking spray or vegetable oil, and wipe it out with a paper towel, leaving only a very thin layer of oil in the molds. This recipe makes 10-12 large lollipops (about 2") so make sure you have enough molds before you begin, or make several half-batches. Insert lollipop sticks into the molds and set aside for now. Combine the water, granulated sugar, and corn syrup in a 2-quart saucepan over medium-high heat. Stir until the sugar dissolves, then wash down the sides of the pan with a wet pastry brush to prevent sugar crystals from forming. Continue to cook the sugar syrup, stirring occasionally, until the thermometer reads 290° Fahrenheit (143° C). Once it is still, stir in the vanilla extract and cake batter extract. Carefully spoon the hot sugar syrup into the prepared molds, making sure that the tops of the sticks are covered with syrup and are well-embedded in the candy. 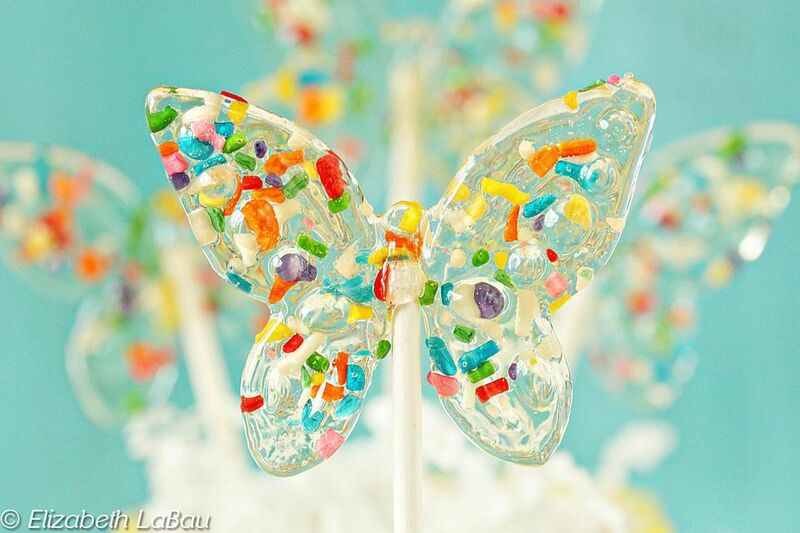 Quickly, sprinkle colored jimmies over the tops of the lollipops. The lollipops will start to harden soon after they're poured, so it's important to work quickly during this step. Let the lollipops sit and harden at room temperature until they are completely cool and firm. Once cool, don't pull them out by the sticks. Instead, carefully flex the back of the molds to remove the lollipops without causing any breakage. Lollipops keep well when stored in a cool, dry environment. For best results, wrap them individually in cling wrap and store them in an airtight container at room temperature. Note: Cake batter flavoring will be your best bet in recreating birthday cake-flavored lollipops, but if you can't find it, there are many other flavorings you can try! Butter flavoring is commonly found in the baking section, and combining butter flavoring with vanilla will get you very close to a cake flavor. You can also experiment with combining vanilla, almond, lemon, and/or "Princess" flavorings to get a nice cake batter flavor. A little goes a long way, so start with small amounts at first, and increase the amount in the next batch if necessary. Click Here to View All Lollipop Recipes!